The thirty five species of Canids in ten genera include the wolves, jackals, foxes, coyotes, dingos, dholes, maned wolves, racoon dogs, bush dogs and African wild dogs. This order evolved in open grassland but modern members are adapted to a wide range of habitats. The smallest is the Fennec fox (24 cm high; 1 kg in weight); the largest is the Gray wolf (200 cm high; 27 kg in weight). 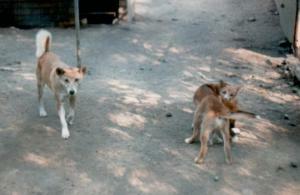 The dog family is one of five families of dog-like mammals descended from the wolf-like Vulperines. An Australian dingo and her cubs illustrates the general appearance of canids. Locked radius and ulna which prevents rotation of the upper fore legs. Canids live mainly but not exclusively on flesh. They have long muzzles well developed jaws and a characteristic dental formula of I 3/3, C1/1, PM 4/4, M 3/2 = 42. The fourth upper premolar and first lower molar exhibit carnassial modification for the shearing of flesh, while crushing molars can handle vegetable foods. 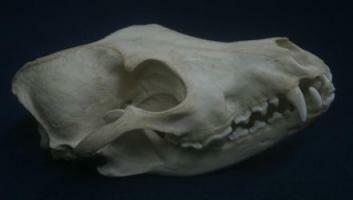 Wolf Skull (Dental Formula: I 3/3, C1/1, PM 4/4, M 3/2 = 42). Wolves (Canis lupus) feed mainly but not exclusively on flesh, deer caribou, moose, beaver, hares, domestic livestock and plant material. The carnassial teeth shear flesh; crushing molars process vegetable food. 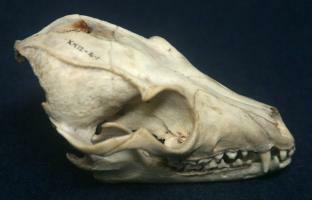 Common or golden jackal skull (Dental Formula: I 3/3, C1/1, PM 4/4, M 3/2 = 42). Common jackals (Canis aureus) occur in North and East Africa, South East Europe, to the Middle East and South East Asia. 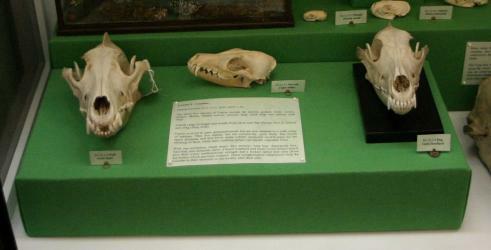 They feed on a very diverse range of prey - small mammals ( e.g. young gazelle, rodents, lagomorphs, monkeys), birds, amphibians, reptiles and invertebrates- as well as carrion and fruit. 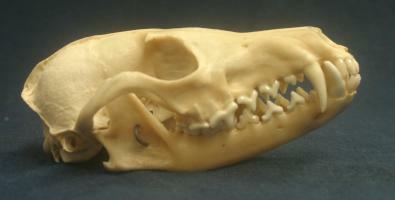 Red fox skull (Dental Formula: I 3/3, C1/1, PM 4/4, M 3/2 = 42). Red foxes (Vulpes vulpes) have a wide distribution throughout the Northern Hemisphere. They have a very varied diet: they feed on rodents, lagomorphs, birds� eggs, beetles and other invertebrates, fruit and carrion. 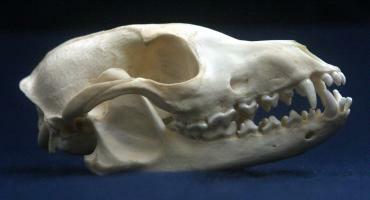 Bat-eared fox skull (Dental Formula: I 3/3, C1/1, PM 4/4, M 3/2 = 42 plus 6 extra molars = 48). Bat-eared foxes (Otocyon megalotis) live in open-grasslands of Africa from Ethiopia and East Africa to South Africa. They feed on invertebrates - mainly harvester termites and dung beetles, plus scorpions � as well as fruit and the occasional mammal and bird. 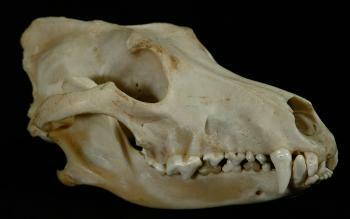 Unusually bat-eared foxes lack the well-developed carnassial teeth and crushing molars of other canids but have extra molars giving them forty-eight teeth in all. Crab-eating zorro skull (Dental Formula: I 3/3, C1/1, PM 4/4, M 3/2 = 42). Crab-eating foxes (Dusicyon thous) are found in savannah and woodland in South america, from Colombia and Venezuela to Northern Argentina. Recent studies suggest that these three foxes represent three separate fox-like lineages; their similar morphologies resulting from convergent or parallel evolution. The bat-eared fox appears to be an ancient canid distinct from all other foxes. 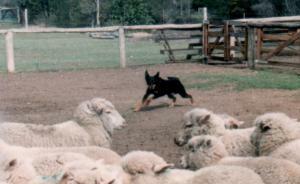 Many breeds of domestic dog have been bred to help humans in a variety of ways, like this Australian sheep dog herding sheep. As it is generally accepted that they are most likely to be descended from wolves the domestic dog is known as a subspecies of wolf (Canis lupus familiaris).